Stop in at any office location and get your blood pressure checked today for free. From our beginning in 2000, 1st First Texas Home Health has and continues to be the recognized agency of choice. Several consecutive years, 1st Texas Home Health has been awarded the one of the Top 20% home health agencies in the Country. In 2018, 1st Texas was the recipient of the HomeCare Elite Top 500 Home Health Agency recognized by Medicare. With nearly 13,000 home health agencies in the Country, we are proud and continue to strive to provide outstanding service to our patients. 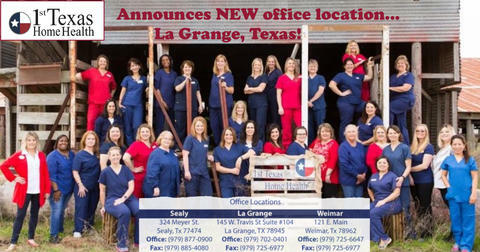 We currently have six home health care locations serving twenty nine counties in North and Southeast Texas. 1st First Texas Home Health was founded on sound Christian values and principles. From the beginning, our business philosophy has been based around one word “Quality”. Personlized service remains and always will be our top priority. We strive to provide the highest most consistent level of home health care available anywhere. 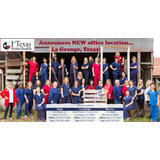 1st Texas Home Health has the staff experience, equipment, medical supplies, and community resources to meet your needs. Traditional Medicare and supplemental insurance covers the cost of our services, pending on benefits. Our insurance professional is happy to check insurance benefits prior to beginning services to ensure cost is within the patient's range. 2017 HomeCare Elite Top 25% Home Health Agency in USA. 2018 HomeCare Elite Top 500 Home Health Agency in USA.